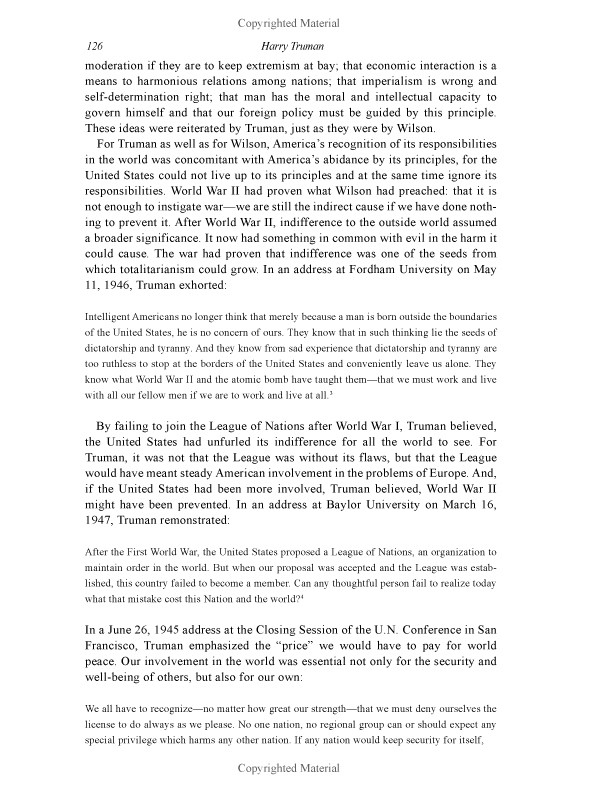 The modern world derives part of its meaning and definition from the foreign policy formulations of Woodrow Wilson and Harry Truman. These presidents viewed the enhancement of American power and the invigoration of American principles as the only response to modern problems such as imperialism, bolshevism, fascism and “total war.” The fact that Europe and Asia had submitted to the disastrous consequences of their ideas meant that we had to project and promote our democratic alternative. If we were to live up to our mission and our character, we had to accept radically new responsibilities. This work reveals the important relationship between these presidents and explores the reverential, yet revolutionary relationship each had with broader American traditions. Wilson came to power at a time when both need and the means for change were apparent. 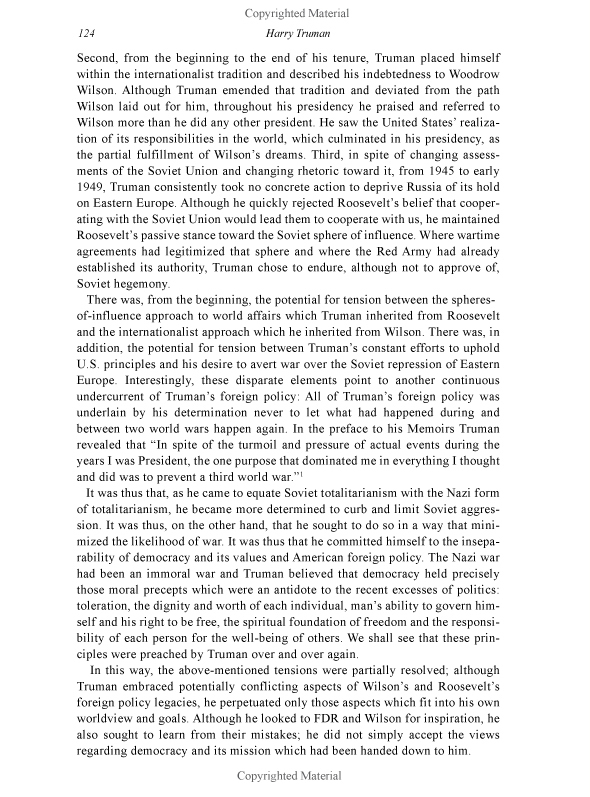 In the face of looming war and global turmoil, Wilson took full advantage of America’s emerging world-power status. While he held to the traditional American ideal of setting a democratic example, he reconceived it as an obligation to actively promote democracy and self-determination abroad. Indeed, he construed our increased involvement in the world as the logical fulfillment of our democratic purpose. 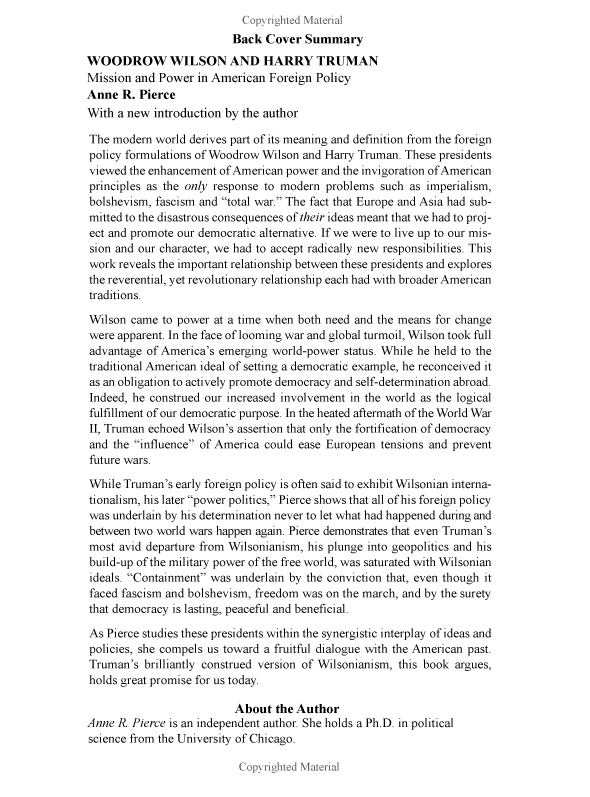 In the heated aftermath of World War II, Truman echoed Wilson’s assertion that only the fortification of democracy and the “influence” of America could ease European tensions and prevent future wars. 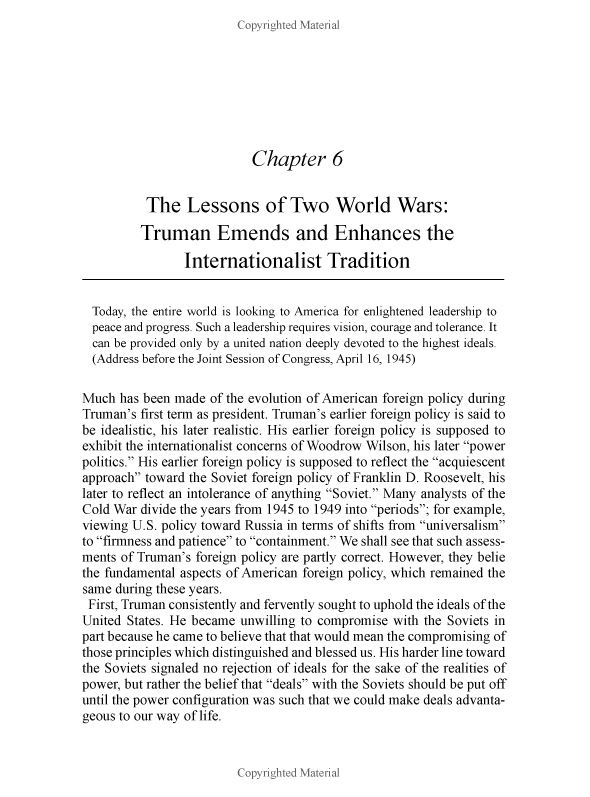 While Truman’s early foreign policy is often said to exhibit Wilsonian internationalism, his later “power politics,” Pierce shows that all of his foreign policy was underlain by his determination never to let what had happened during and between two world wars happen again. 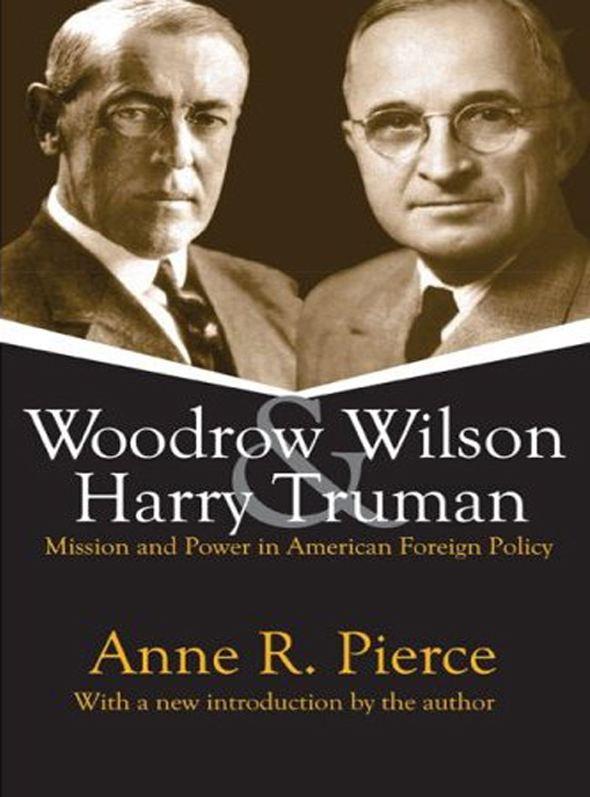 Pierce demonstrates that even Truman’s most avid departure from Wilsonianism, his plunge into geopolitics and his build-up of the military power of the free world, was saturated with Wilsonian ideals. “Containment” was underlain by the conviction that, even though it faced fascism and bolshevism, freedom was on the march, and by the surety that democracy is lasting, peaceful and beneficial. As Pierce studies these presidents within the synergistic interplay of ideas and policies, she compels us toward a fruitful dialogue with the American past. 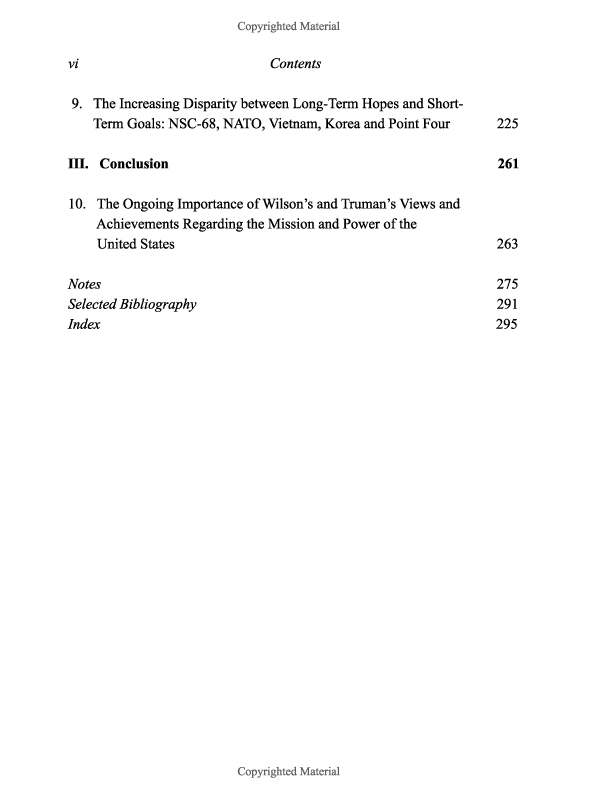 Truman’s brilliantly construed version of Wilsonianism, this book argues, holds great promise for us today. 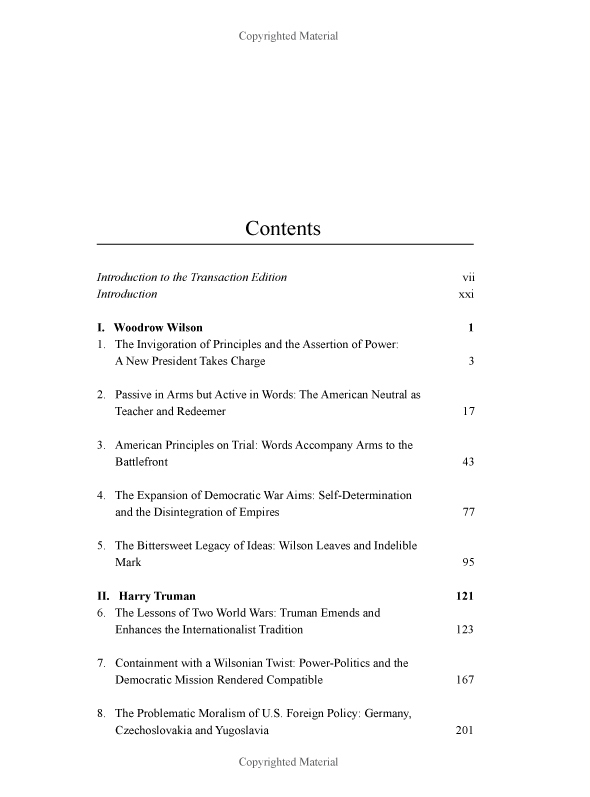 “In a welcome relief from too many works on foreign policy, Anne Pierce’s Woodrow Wilson and Harry Truman rejects the sort of reductionist view of political interpretation that sees foreign policy solely in terms of a single variable or a single dichotomy, economics or ideology, consensus versus change, liberal versus conservative, idealism versus realism. 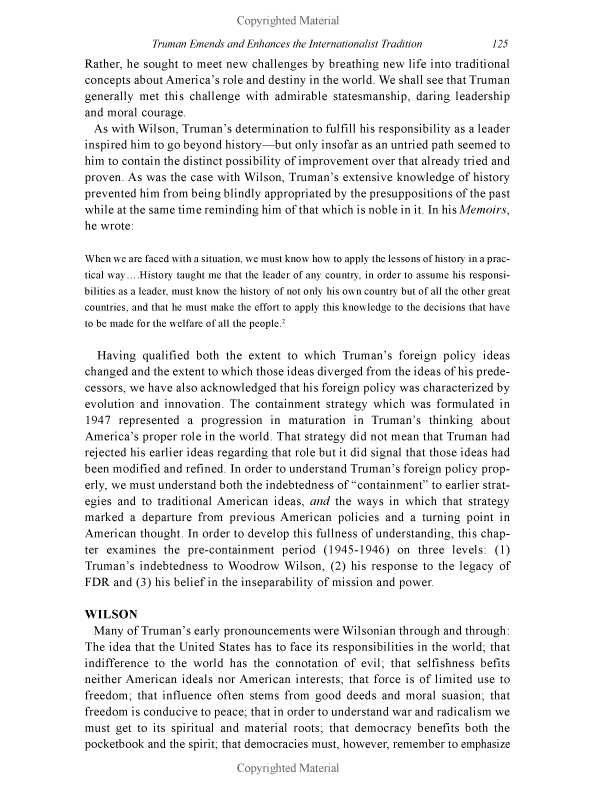 ‘If we must use such categories,’ she says, ‘we must admit the following: At the end of his term, Truman was an idealist engaged in pragmatic geopolitics, a pragmatist determined to uphold and perpetuate Wilsonian ideals and a political liberal bent on conserving the best in American political traditions and American political thought.’ Her analysis of the formative periods of 20th-century American foreign policy, the presidencies of Woodrow Wilson and Harry Truman, is actually a bit broader than the subtitle of her work, Mission and Power in American Foreign Policy, would suggest. By ‘mission’ she means the principles that have animated American politics since the founding: by ‘power’ she means the policies pursued by presidents Wilson and Truman in pursuit of those principles in the context of their time. How these two ideas are intertwined is the heart of her well-reasoned and tightly argued work.